I haven’t been collecting much lately as I’ve been focused (pun intended) on shooting and creating images more. However, in a casual perusal of Ebay the other day I found this image. 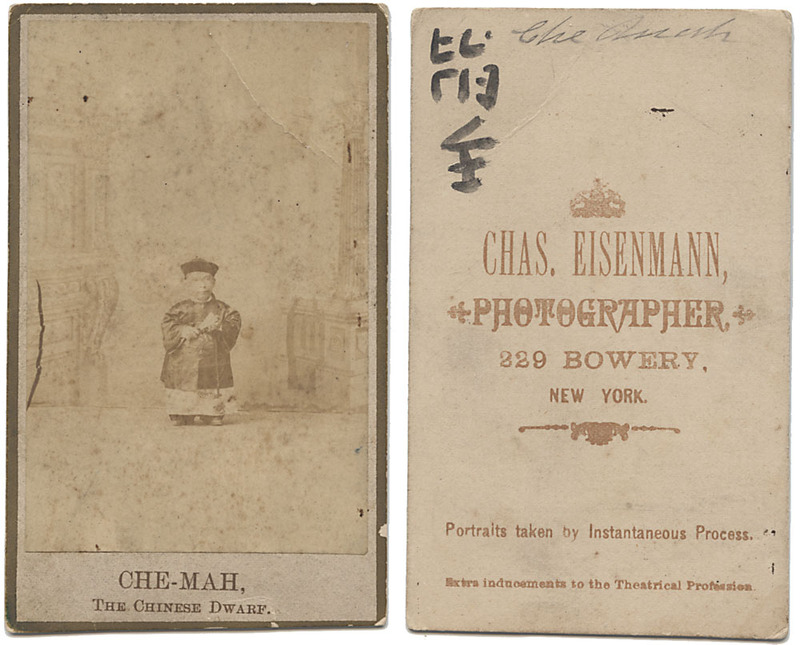 I’ve been wanting a CDV of Che Mah for a while. This one is rather faded and not in the best of condition, but I jumped on it as A: it was a reasonable price, and B: CDVs of Che Mah don’t show up all that often. I’ll shop around for another one in better condition later, but having this one fills a gap in my collection. Regardless of his ethnicity and country of origin, Che Mah was a popular attraction and throughout his career he worked in the Barnum & Bailey Circus, Kohl and Middleton dime museum in Chicago and Buffalo Bill’s Wild West Show. Upon retirement, he bought a farm in rural Indiana but working a farm proved to be too difficult. He sold the farm and brought a house in Knox. Che Mah died in 1936 and was buried in Crown Hill Cemetery in Knox, Indiana. 1.Hartzman Marc, American Sideshow. New York: Tarcher. 2006. 27. Print. 2.Homberger, Francine. Carny Folk. New York: Citadel. 2005. 1-3. Print. Note the signature in the upper left of the verso. It appears to be hand-signed in ink, so that may well be his actual signature.